Tulip Tragedy at the Royal Wedding! Off With Their Heads! Woe is the fate of these poor tulips, casualties of Royal Wedding Fever. This article from London’s Daily Mail makes me sad, and kind of irritated – read on to see how a gift of replacement flowers was rebuffed. I think the gardening company involved should tell the Royal Gardeners to sod off. 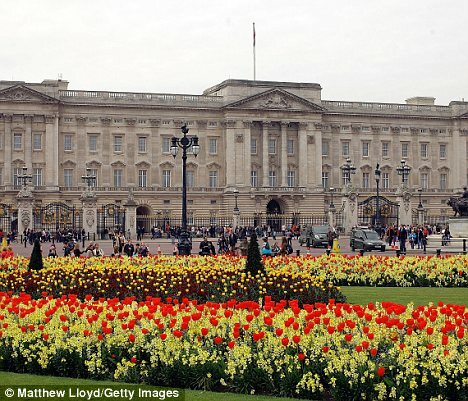 Thousands of red tulips planted in the gardens in front of Buckingham Palace and expected to bloom in time for the Royal Wedding will be cut down after wilting in the hot weather. The 28,000 flowers were planted last October but have blossomed too early. Now staff from Royal Parks – the organisation that maintains all of the capital’s most famous parks – plan to chop the heads off the drooping tulips before the wedding, and say they cannot afford to replace them because of recent Government cuts. The sight of the decapitated flowers in the Queen Victoria Memorial Gardens could be a major embarrassment as the eyes of the world will be on the Palace on Friday. Yet when two of Britain’s largest flower suppliers offered to donate 20,000 red geraniums to replace the tulips, they were turned down. Royal Parks said geraniums were too small to be a like-for-like replacement for the tulips and would be dwarfed by the 29,000 other flowers already there. Delamore, one of the biggest bedding-plant retailers in Britain, and Thompson & Morgan, which says it is the UK’s largest plant and seed company, made the offer. They said they would split the £4,000 cost of the geraniums because they both hold Royal Charters and felt obliged to help Royal Parks out of its predicament. Wayne Eadie, owner and director of Delamore, said: ‘It’s a great shame because we really wanted to help. It’s also a shame that cutbacks at Royal Parks mean it can’t do something about this situation itself. 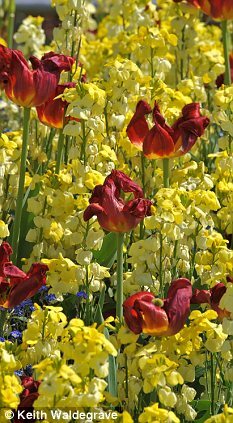 The tulips were planted last October along with wallflowers in red and yellow, and blue forget-me-nots. Unseasonably hot weather caused the tulips to bloom three weeks early, with the result that yesterday most of the petals’ colour was fading from deep crimson to dark purple. Some of the tulips had shed their petals entirely. 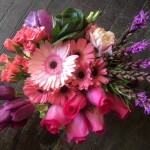 The Royal Horticultural Society’s adviser, Guy Barter, said: ‘The problem with tulips is that they are a one-shot deal. ‘Once they come out, that is that. In this weather their bloom will last only a couple of days and it could take only a week for all of their petals to be shed. Royal Parks, which is overseen by the Department for Culture, Media and Sport, says its budget has been cut by 36 per cent this year. A Royal Parks spokesman said: ‘The tulip blooms will indeed soon be over due to the unseasonably warm weather we are experiencing at present, and these will be removed before the end of the week. However, the tulips form only part of the bedding display. ‘Vibrant colour is provided by the 29,000 wallflowers and 4,000 forget-me-nots, all of which are expected to be in full bloom on the day. Posh in Purple? The Queen in a Yellow Hat? Would you put money on it?